!!! PLEASE DO NOT COPY ANY INFORMATION FROM THIS PAGE WITHOUT MY PERMISSION !!! PLEASE SEE THE WIKI for the Pros/Cons of using the Alltel firmware FIRST!! Currently, Verizon V3C, V3M, and KRZR K1m MONSTER firmwares have been leaked, so if you can NOT get this working, you can flash back to the Verizon Monsters and be just like the "fresh out of the box" Verizon state. See -> Flash from Alltel Firmware back to Verizon's Firmware. I only have a V3C to try this on... and it works for me... In theory, it should also work for V3M and Krzr K1M Alltel monster firmwares, BUT I can NOT personally test since I don't have those phones!!! PLEASE READ THE ENTIRE GUIDE CAREFULLY BEFORE YOU ATTEMPT THIS!!!! THIS DOES VOID YOUR WARRANT!! And Verizon will NOT support you with the Alltel firmware on your phone! As you can see by reading the linked threads and such.. a lot of people have worked hard to come up with this!! Thanks to Jlbrightbill, DanFPW, cpuguy06, and the others posting in the threads.... Special Thanks to GoldMembr, without whom, none of this would be possible... and KBMAN for putting ideas in my head, and providing suggestions, feed back and valuable info! And Thanks to Evade for the RadioComm info and the idea about using the table for backup and restore of the SEEMS!! NOTE: I may still have a few corrections/edits to make over the next few days/weeks?? 2. Install the Motorola USB Modem drivers. 3. Install and configure Motorola PST v7.25 and its drivers, along with testing its connection (Formerly known as the Prep-work section of the Seem Edit page). (Sorry, No WAREZ links here). 13. WinRAR by Rarlab needed to unpack .RAR files. Prior to completing these backups your phone must be running the Verizon Firmware... Active on your account and you have done a *228 opt 1, and *228 opt 2 on it, and the phone and all of its features must be completely working on the VERIZON Firmware!! Failure to be in this state prior to starting will mean FAILURE in the end. Example... I used VZW's My Account -> Activate phone, to switch to my V3C.. did *228 opt 1 & Opt 2... then used My Accont -> Activate, to switch back to my E815 while I then flashed and worked with the V3C... When all the fixes were applied and done... I switched back to the V3C being active on my account and tried it out... NOTE: I did NOT do a *228 after I switched back. NOTE: If you do NOT have another EVDO phone to activate on your account while performing the rest of the tutorial, it has been suggested to please make use of the Airplane Mode setting on the Alltel firmware once you've flashed... On the phone... Menu -> Tools -> Air Plane Mode... set Airplane Mode = ON. Then when you are complete with this tutorial, go back in and turn Airplane Mode OFF. NOTE: the Air Plane Mode trick doesn't always work... so another suggested method is to leave the phone powered off after flash, then restore the seems with RadioComm, the items with PST, and the QPST Service programming... One that is done, you can power the phone back on. However, some of the tools will not work with the phone off. See what luiset83 posted HERE for details. NOTE: These files are essential to restoring your phone to a working state! Do not proceed to flashing if you are unable to back up ANY ONE of these items! Use Qualcomm QPST to backup service programming..... Unplug your phone from the PC, power it off, then back on, and re-connect it to the PC. Use the QPST Configuration program, make sure your phone is displayed/available... Select the port with your phone, then use the Start Client pull down, select Service Programming. At the phone selection screen, your phone should be listed and highlighted, click OK. Click the READ FROM PHONE button. On the "Enter Service Programming Code" screen, enter 000000 (or your phones SPC), and click OK. When the read is complete, and you see values filled in, click the SAVE TO FILE button. The file name box will automatically be filled in as your phone's ESN number followed by _SP... (example: 1A3333Ad_SP) click the Save button. Click on the Connection pull down in QPST Service Programming, and click EXIT. Exit the QPST Configuration program. Unplug the phone, power it off, then back on. Repeat the process using PST to backup each of the following... CDMA Enhanced Roaming Indicator (ERI) File, CDMA Preferred Roaming File, Feature File, Mobile IP File (NOTE: you might get an error stating this may or may not be supported, click YES to continue, it will report Partially completed), MMS Data File, RTT Data File and RTT Browser File (NOTE: have Ver 6.x tab selected before you click READ FROM PHONE). Repeat the process using PST to backup CDMA NAM File, but before you close the CDMA Nam file, please write down your Mobile Identification Number (MIN) and Mobile Directory Number (MDN) values. You will need these later in the guide. They can be found on Lines 3 & 4 of the NAM 1 Contents column. NOTE: Not all of the PST backups will be used for this process, but they are good to have "just in case..."
NOTE: You do not need to exit PST, or unplug/poweroff/poweron/replug between READ operations. Unplug your phone from the PC, power it off, then back on, and re-connect it to the PC. Use the Settings pull down menu. Select USB -> M-Link USB Driver. In the Main RadioComm window, click on the P2K 1 tab. The PC should "beep", and you should see the Radio Detection change from a blue ciricle to a Green circle. Use the Features pull down menu. Select NV/Seem. In the TABLE box, click the OPEN button. Browse to the MonsterSeems.NVM file you've downloaded, select it, and click OK. In the Action box, click the READ button. When the read has completed, in the Table box, click the SAVE button. File name will default to your phone's ESN number. Example: A123455. Close the seem window using the X in the upper right, then exit out of RadioComm. Unplug the phone, press and hold the power button, the screen will blink. Then turn the phone back on. Note: you may have to remove/re-insert the phone's battery to turn it back on. Use BitPim to backup the following files..
/nvm/seem/cdma_sec NOTE: K1M users may not be able to back this file up... in that case, seem 01D2 contains this data! If you were unsuccessful backing up ANY of the files in section 1, please STOP and DO NOT FLASH YOUR PHONE!!! Please see the -> HOW TO FLASH <- page for the latest updates/notes and FULL information. Please do NOT do a *228 when you have the Alltel firmware on your phone. NOTE: If you do NOT have another EVDO phone to activate on your account while performing the rest of the tutorial, it has been suggested to please make use of the Airplane Mode setting on the Alltel firmware... On the phone... Menu -> Tools -> Air Plane Mode... set Airplane Mode = ON. NOTE: Please now manually backup your ALLTEL 2742 bytes 0000 record 1 seem using P2kSeem before you proceed!!! 3a.Use Qualcom QPST to Restore service programming..... Unplug your phone from the PC, power it off, then back on, and re-connect it to the PC. Use the QPST Configuration program, make sure your phone is displayed/available... Select the port with your phone, then use the Start Client pull down, select Service Programming. At the phone selection screen, your phone should be listed and highlighted, click OK. Click the LOAD FROM FILE button. Navigate, find and select your ESN#_SP.QCN file you created earlier. Click OPEN. Click the WRITE TO PHONE button. On the "Enter Service Programming Code" screen, enter 000000 (or your phones SPC), and click OK. 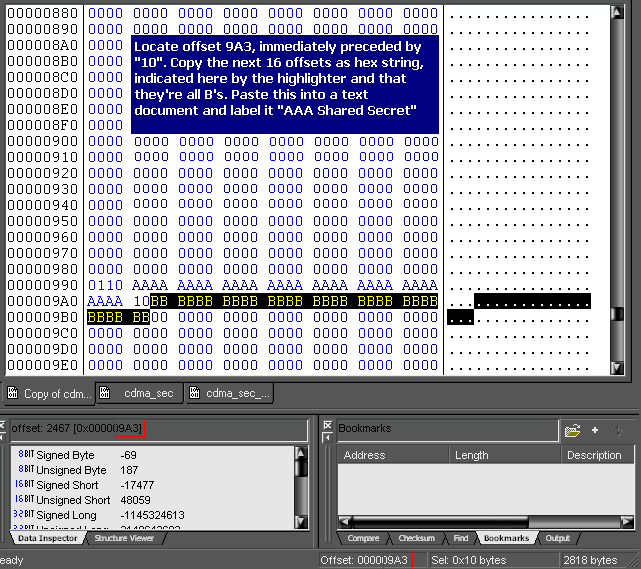 When the write is complete, click on the Connection pull down in QPST Service Programming, and click EXIT. Exit the QPST Configuration program. 3b. Use Motorola PST to Restore additional files.... Start PST Phone Programmer. Use the File pull down, and click on OPEN. Select BREW File, and click OK. Browse for, and select your previously backed up file. Use the Phone pull down menu and click on WRITE. When the PST Phone Programmer Progress window indicates the WRITE Procedure has completed successfully (it says "It's now safe to disconnect the phone"), close that progress window. Repeat the process using PST to restore each of the following that you backed up earlier... CDMA ERI File, MMS Data File (NOTE: Prior to writing, please change the "Album Upload Address" field to 9995551212@pix.vtext.com, where 9995551212 = your 10digit phone number, BEFORE your write to phone), and RTT Data File. OPTIONAL PST RESTORES: Due to using QPST to backup/restore the Service Programming, you should not need to restore the following files at this time... CDMA NAM File, CDMA Preferred Roaming File, Feature File, and Mobile IP File (NOTE: you might get an error stating this may or may not be supported, click YES to continue, it will report Partially completed). If you experience problems... then restore these files. 3c. Use RADIOCOMM to restore your seems.... NOTE: this will write the 2742 Seem that was on your phone when the backup was run.. So, if you ran the backup while the VERIZON firmware was on your phone, it will restore the Verizon 2742 seem to your phone... as such.. Please Stop now, use P2KSeem for V710 to backup your ALLTEL 2742 seem file BEFORE you use RadioComm to restore the seems. In the TABLE box, click the OPEN button. Browse to the ESN .NVM file that was created in the backup steps (example: A123455.NVM) , select it, and click OK. In the Action box, click the WRITE button. 3d. 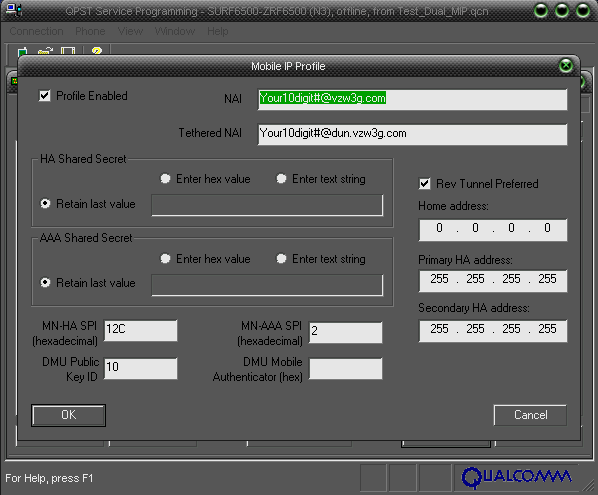 NOTE: V3M/K1M Only: Use P2KSeem for V710 to edit the 01D0 seem, selects the second M.IP Profile. 3e. Use P2KSeem for V710 to restore your ALLTEL 2742 Seem. Offset 006F bit 1 - checked, to allow VZ Navigator GPS to function. NOTE: default setting is Automatic B for VZW but that choice is only there on the Alltel firmware after seem edit. Offset 000C, Bit 1 = checked to "Enable scrolling through missed calls with flip closed"
Offset 0038, bit 1, 2 & 3 checked to enable continental, classic, and attention alerts or ring tones. 4. Overwrite files... Enable GIN appmgr, Change the GIN icons, and load custom MMA_UCP/MMA_DCP files, vCast fixes, etc. NOTE: Originally the 12513.p2kc and 13478.p2kc files were used to restore the vCast Video icon. Since then, a free vCast update has become available in the Get-it-Now catalog... under... Get Going -> Featured Apps -> VCast. Please download this FREE update instead!! However, if you are on a NationWide plan, acceessing GIN and downloading apps will cost $1.99 per MB unless you have the $15 Vcast Vpack!!! V3C users should now see this update. Please use this FREE update to install Vcast instead of the following P2KC scripts!! Using the following scripts may get you the vCast Video icon back, BUT the application may not have working sound. So it is suggested to download the vCast Update from the Get-it-Now catalog instead!! Again, this will cost users on NationWide plans $1.99 per MB. 5. Edit and restore RTT Browser file. When using the default Verizon config files, you need to create a new Web Session on your phone to handle the MMS/PIX Messaging, you may also need to edit the USER ID field of the default VZW web session. If you are using backups from an already 100 % working Alltel flashed phone, these settings may be configured properly so do these steps just to VERIFY... However, when using backups from Verizon firmware, these steps are Mandatory!! Unplug your phone from the PC, power it off, then back on, and re-connect it to the PC. Start PST Phone Programmer. Use the File pull down, and click on OPEN. Select RTT 1x-Browser, and click OK. Browse for, and select your previously backed up file. Click on the Version 6.x tab. On the Proxy 1 tab, change the User ID from %m to 9995551212, where 9995551212 is your Phone Number. Note: Some have had to use their 10digit MDN or 10digit MIN as written down earlier in section 1. (NOTE: this is a step I have not had to do, but others have.) Leave the other fields untouched. Click on the Proxy 2 tab. Leave the other fields untouched. If you have a Personal "free" WAP proxy, you may click on the Proxy 3 tab, and enter the appropriate fields to configure that web session now. When you have finished, use the Phone pull down menu and click on WRITE. When the PST Phone Programmer Progress window indicates the WRITE Procedure has completed successfully (it says "It's now safe to disconnect the phone"), close that progress window. Exit PST. Disconnect the phone from the PC. On the phone... Go Menu -> Messages -> press Options soft key. From the list, select Inbox Setup. Select MMS Message Setup. Highlight Server Info, and press the Change soft key. On the Current Server screen, press the Option soft key. On the Server Info screen, select EDIT. Verify the Server Name and Web Session Name match VZW values. Service Name = VZW, Server Name = http://mms.vtext.com/servlets/mms, Web Session = VZW_MMS. Note: After you hit OK the phone might report… “Notify ALLTEL of change” just disregard ! 6. Change the phone's Default network mode. By default, the Alltel firmware may not have a selection made for "Network -> Set Mode" however, Verizon's default is AutoMatic B. On the phone go Menu -> Settings -> Network -> Set Mode... and make sure Automatic B is selected. NOTE: to have the choice for Automatic B in the menu, you must have done the MANDATORY 2742 seem edits in section 3. NOTE: due to the use of QPST and the various PST backups, this option may be correctly set, BUT you do want to verify this! NOTE: if you Edited the RADIOCOMM backup file before restoring (as listed in section 3c1 above)... and your data (mms, get-it-now, wap, etc) works in EVDO mode, you can skip this section. NOTE: Earlier, you used RadioComm to backup, which created a file name that defaults to your phone's ESN number. Example: A123455.NVM. That backup file contains a copy of your 01D2 seem... While its not explicitly spelled out in the guide, the strings are just located in a slightly different spot... So open up your 01D2 seem (or the NVM Backup made by Radiocom with notepad), and you will see the same pattern as depicted in the the two SCREEN SHOTS included in part 1 below (0110 to start, 10 in between)... so you can grab the strings from there when you are doing the following steps. 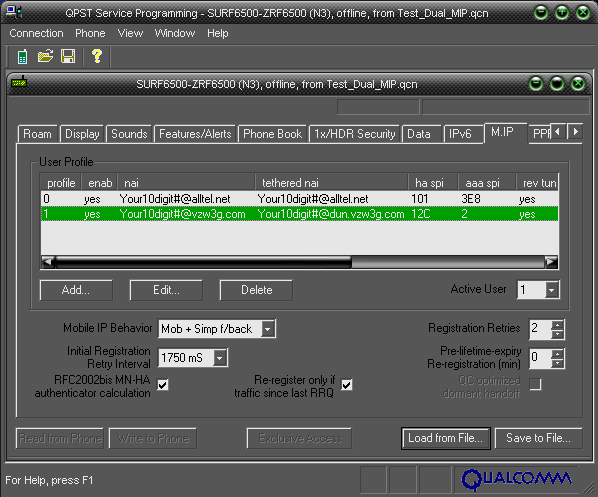 Open QPST's Service Programming and load values from phone. Scroll to the M.IP tab, and select "Add". Configure the new profile as the screenshots indicate. mip1ki4.png and mip2bc6.png. NOTE: tethered NAI won't stay, but it won't affect the data fixes. NOTE: if you can't get the nvm/cdma_sec backed up, you can use your backed up Seem 01d2. NOTE #2: Many reports have said this guide only results in working data after doing using the ESN changer to reprovision data OR calling CS to get it reprovisioned that way. Once data is working completely over 1X, move on to this next step. 1. 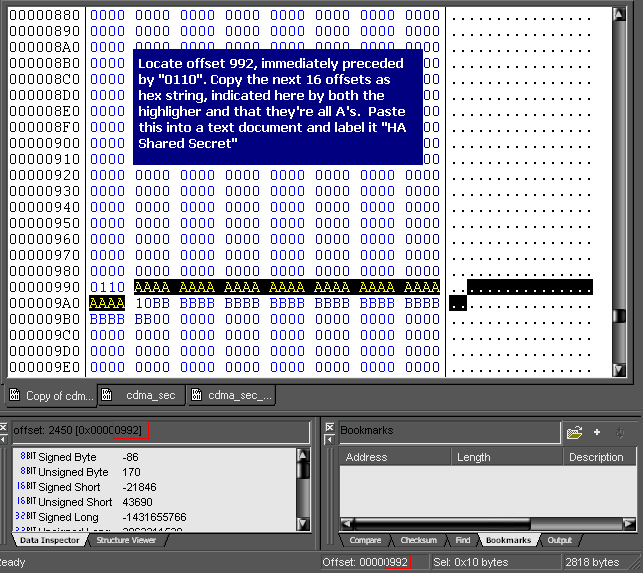 Open your backup of cdma_sec in a hex editor, I personally use Hex Workshop, but Winhex or others will work as well. Use the instructions contained in these two images to copy your HA Shared Secret and AAA Shared Secret keys. Of course on your particular backup the string won't be all A's and all B's, I used them to clearly point out exactly what you're looking for. 2. Open QPST's Service Programming and select "Load from Phone"
3. Select "Enter hex value" on both HA Shared Secret and AAA Shared Secret. 4. Paste the two strings you copied before into the proper location, hit OK, then write to phone. Once these are written the two fields will switch back to "Retain last value" if you read from phone again, but the strings will be written to cdma_sec so "Retain last value" means it will use them. EVDO data should work now. 8. Re-Activate the phone on your account. Use Verizon's My Account -> Activate phone, to switch back to your Razr/Krzr. DO NOT Do a *228 like the web page says!! For how to use Verizon's "on line ESN Swapper" to switch which phone is active on your account.. Evade has a great illustrated write up, so please see the ACTIVATE PHONE section of -> http://motorola.szczuka.org/Hollywood_VZW_Bell.html NOTE: this will only work when switching between two EVDO phones... DO NOT PERFORM A *228!! If you choose to make use of the Airplane Mode setting on the Alltel firmware once you've flashed, go back in and turn it OFF... On the phone... Menu -> Tools -> Air Plane Mode... set Airplane Mode = OFF. If you do a Master Reset, the 275A seem will get re-written with the PRE-EDITED values, All edits you made willbe lost. To prevent this, any seem edits you've performed on the 275A seem must be done to the 275B seem as well. There is still discussion as to whether *228 will corrupted data services when using the Alltel MONSTER firmwares. So it is up to you.. Take a chance updating your PRL by using *228 opt 2 , or just manually update using PST from now on. DO NOT SKIM THE GUIDE AND ASSUME!!!!!!! 4. /nvm/seem/cdma_sec may not be able to be backed up on K1M phones... BUT section 3c1 mentions a way that can get around this, If it works, you don't need to worry about the HA/AAA Shared Secret strings... if it doesn't work, section 7 does state that 01D2 seem contains these strings.... While its not explicitly spelled out in the guide, the strings are just located in a slightly different spot... open up your 01D2 seem (or the NVM Backup made by Radiocom with notepad), and you will see the same pattern as depicted in the SCREEN SHOTS in Section 7 (0110 to start, 10 in between)... so you can grab the strings from there when you are doing section 7.
and write this Pre-Edited 2771, record 1, 30 bytes (h) seem.. and restart the phone. For additional info... see also the discussion in -> Hosed Your V3c Outside LCD Logo? I HAVE A FIX!!!! copy all the files to it. Then Restart the phone (power off/on). Always use BitPim to remove additional skin files and folders, then restart the phone. P2kcommander can remove the files, but it will not show you the empty folders, and those empty folders will still show as a skin choice. Changing VERIZON WIRELESS on the internal LCD. In the Roaming Indicator Table section... Lines 1 & 2, change the Text Displayed from VERIZON WIRELESS to anything you want displayed (up to 18 characters). Note: click on the word Verizon for the cursor to appear in the text box. Use the Phone pull down menu and click on WRITE. When the PST Phone Programmer Progress window indicates the WRITE Procedure has completed successfully (it says "It's now safe to disconnect the phone"), close that progress window. Use the Phone Pull down menu and click Restart. When the PST Phone Programmer Progress window indicates the Restart Procedure has completed successfully (it says "It's now safe to disconnect the phone"), close that progress window, and exit PST.